If you’ve been looking for a premium quality stock for a new gun project, now’s the time to buy. 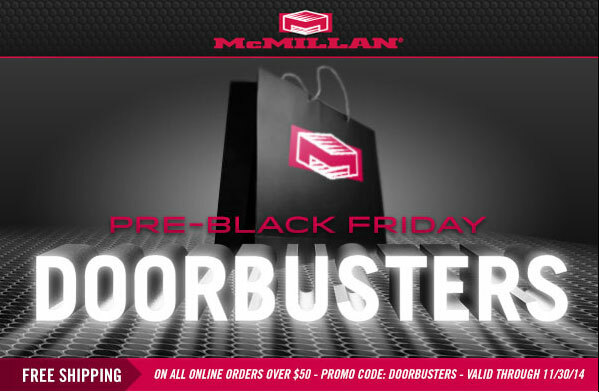 McMillan is offering exceptional deals now through November 30, 2014. As part of a pre-Black Friday promotion, prices have been slashed by as much as $342 on many of McMillan’s most popular stocks, including the A5 for Rem 700 Long action. Along with big savings on the purchase price of stocks, you can even get FREE ground shipping with Promo Code “DOORBUSTER”. Shown below are some of the items originally on sale — but there were other discounted stocks in McMillan’s Online Store. You can find some awesome deals this week — but be advised that the Doorbuster sale prices are for a limited time. Also the free shipping offer expires November 30, 2014. In addition, these sale items are “Limited inventory — While supplies last”. There will be no rain checks, and shipping charges on previous orders will not be reimbursed. 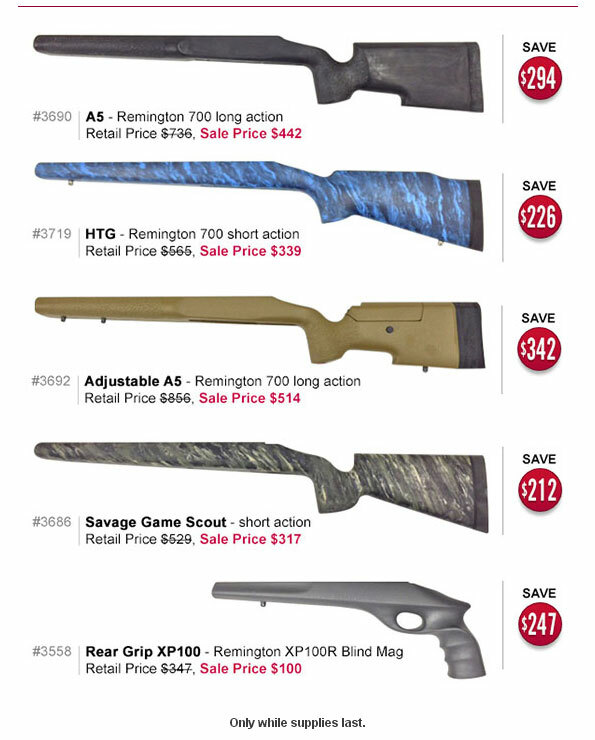 Share the post "Huge Savings This Week on McMillan Fiberglass Stocks"
Here’s a new way to store firearms securely. All an intruder will see is an innocent-looking wall mirror. But behind that artifice is a gun cabinet that will hold a rifle or shotgun, a pistol and more. For added security, the firearms in the cabinet are clamped by a rapid biometric locking system that releases the guns only for authorized users. 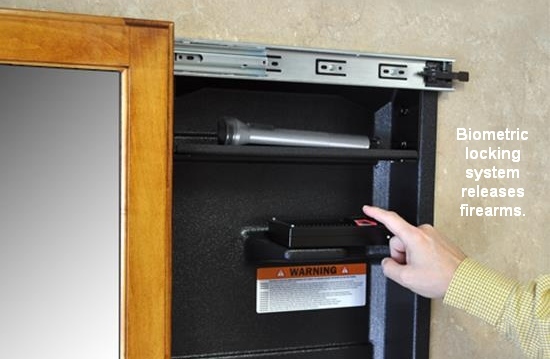 The patent-pending NRA Home Defense Cabinet is a covert gun cabinet featuring a sliding mirrored front and proprietary biometric securing system. The Cabinet is offered in both dual-firearm and single-firearm configurations. Slide open the cabinet and you can see the guns, securely clamped in place. When an authorized user successfully engages the biometric system, your firearms are unlocked and ready for use. The discrete cabinet doesn’t communicate “guns inside” like a bedside handgun safe. Also, the simple-looking mirror offers nothing to attract the attention of intruders or children. The interior of the NRA Home Defense Cabinet Features a proprietary biometric locking system. The NRA Home Defense cabinet is offered in a one-gun version (rifle/shotgun) for $950.00, or a two-gun version for $1250.00. Since this product is recessed into a wall, you also have to figure on installation costs. But if you are building a new house, this is an interesting new security option worth considering. Share the post "Biometric-Activated Recessed Gun Cabinet Hides behind Mirror"